This is an amazing recipe from Boston chef Joanne Chang. I had the pleasure of meeting her when I filmed her making bread pudding for my Dorm Room Chef video series. I must have been a little nervous because I used the wrong settings on my camera and ended up filming her mostly in the dark. Thankfully, I was able to lighten it a bit in the edit, but still it wasn’t my best work. Chang, however, rose to the occasion with grace and charm, telling me not worry about it after making a delicious and easy-to-make dessert. 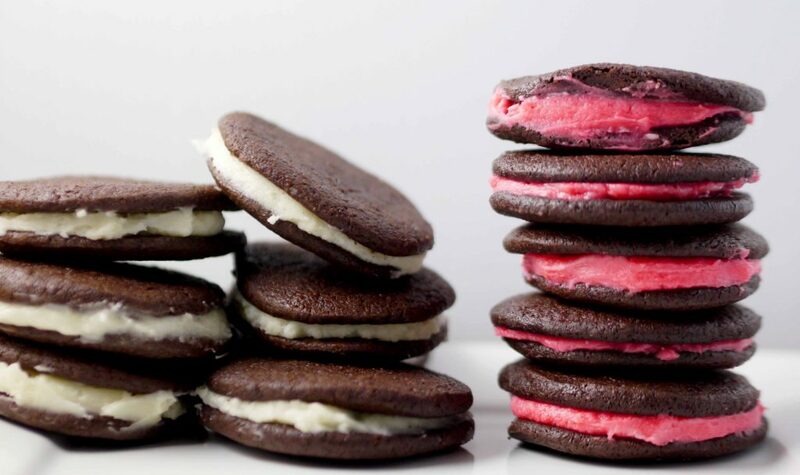 These cookies are like crunchy whoopie pies. 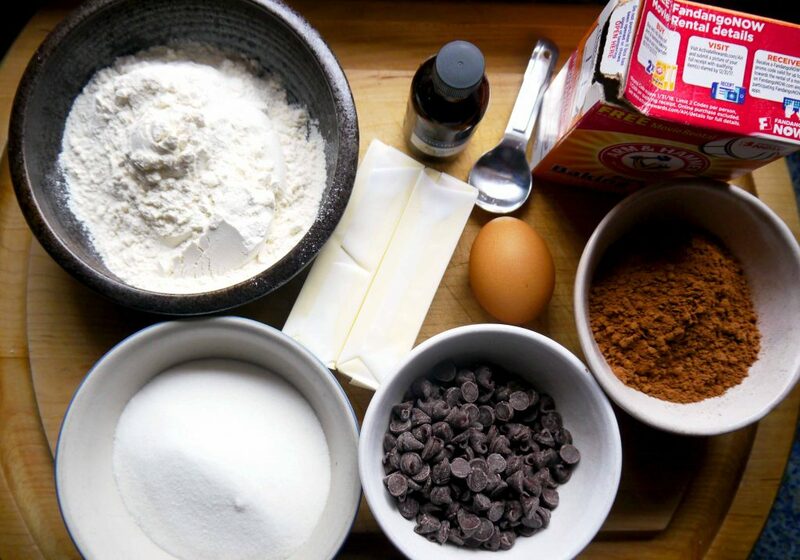 This recipe for homemade Oreo cookies, isn’t as easy as all that, but it’s brilliant. Store-bought Oreos are delicious but these are even better with real flavors replacing the processed ones. You not only get a better-tasting cookie, you get a cookie you can feel better about eating. Semi-sweet chocolate chips and unsweetened cocoa are used to make these cookies. I got the recipe through BostonChefs.com. The only problem I had was that I didn’t have enough filling so I ended making another batch of it. The recipe said it would make between 16-18 cookies, but I was able to make 23, maybe that’s why I needed more filling. In any case, I increased the portions for the filling here, so you shouldn’t fall short. The dough starts out floury but then gets moist, almost like the texture of Play-Doh. 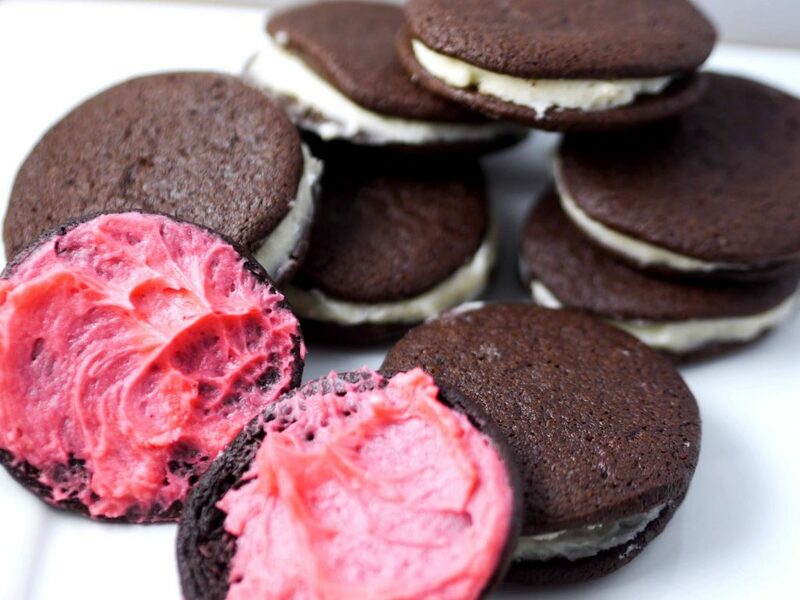 In the spirit of Valentine’s Day, I added a drop of red food coloring to some of the filling, resulting in a batch of white and red filled Oreo cookies. For the Fourth of July, maybe I’ll add blue too. If you don’t roll the dough tightly, you’ll end up with air holes in the center of the cookies. But don’t worry, they fill in when you bake them. Servings : Makes about 23 cookies. This recipe from Boston Chef Joanne Chang takes a little work and some time. You have to let the dough rest about an hour at room temperature and later you have to let it sit in the refrigerator for at least 2 hours. Step 1 For the cookies: Combine the melted butter and sugar in a medium bowl and whisk until combined. Whisk in the vanilla and the melted chocolate. Add the egg and whisk until combined. Step 2 In another bowl, combine the flour, cocoa powder, baking soda, and salt. 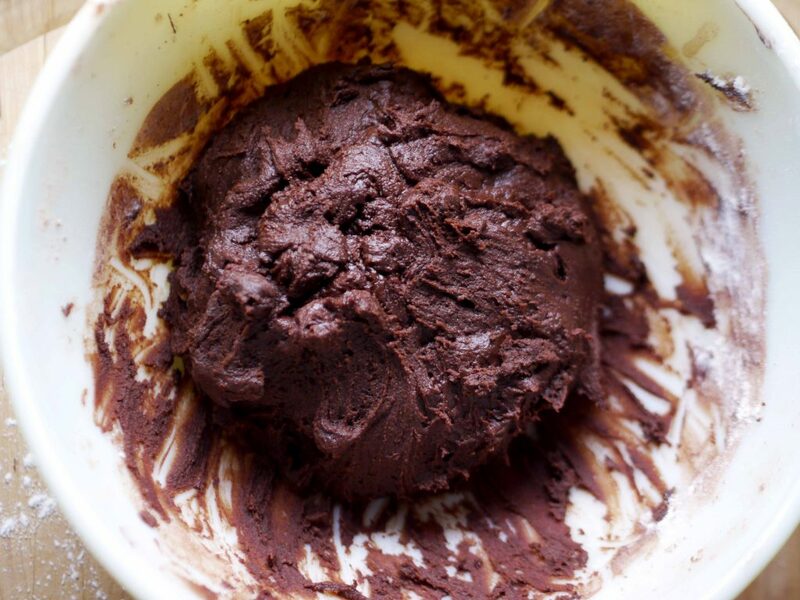 Use a wooden spoon to stir the flour mixture into the chocolate mixture. Mix with your hands until it’s moist and the consistency of Play-Doh. Let dough sit for about an hour at room temperature to firm up. Step 3 Place the dough on a sheet of parchment paper. Shape with your hands into a rough log shape, about 10 inches long and 2 1/2 inches in diameter. Step 4 Place the log at the edge of the sheet of parchment paper and roll the parchment around the log. With the log fully encased in parchment, roll it into a smoother log shape (still 2 1/2 inches in diameter). Step 5 Refrigerate the log until firm, at least two hours. The dough log may settle and sink a bit in the fridge, so re-roll it every 15 minutes or so to keep the shape a nice round log shape if you like. If not, your cookies may be more oblong than round, which is not a bad thing taste-wise but they won’t look quite like the packaged cookie. You can prepare the dough up to this point and refrigerate it wrapped in plastic in the refrigerator for up to 1 week or wrapped in plastic in the freezer for up to a month (if frozen, remove the dough from the freezer the night before you want to bake it and defrost it in the refrigerator). Step 6 Heat the oven to 325 degrees. Step 7 Remove the parchment from the dough log and slice the log into 1/4-inch-thick slices. Place the slices about 1 inch apart on a cookie sheet lined with parchment paper and bake for 20 to 25 minutes, until firm to the touch. Check them frequently after 15 minutes or so and poke them in the middle. As soon as they feel firm to the touch remove from the oven. You can’t judge by color because they start out looking black. Let cool to warm or room temperature on the cookie sheet or a wire rack—they don’t have to cool completely, but you can’t fill them while they are hot. Step 8 Use a tablespoon to scoop out a rounded tablespoon of Vanilla Cream Filling (recipe follows) and place the filling between two cookies. Press the cookies together to distribute the filling toward the edges. 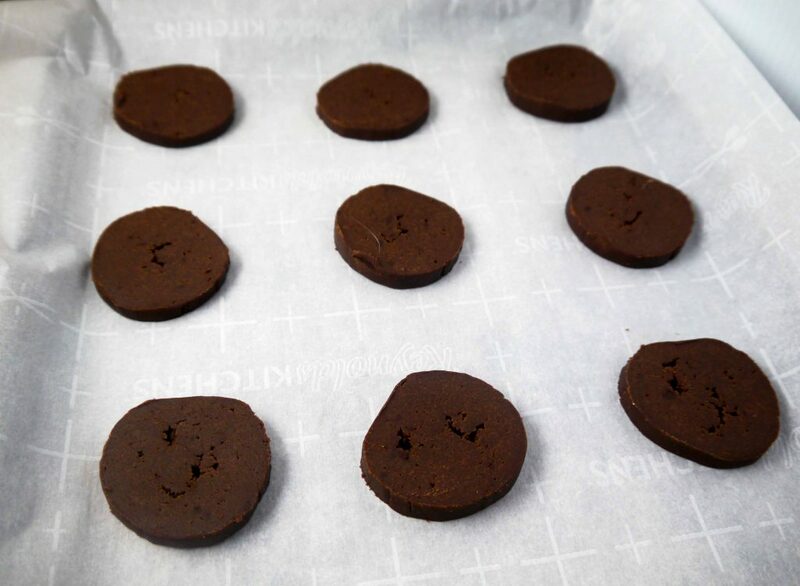 The cookies may be stored for up to 3 days at room temperature in an airtight container. Step 9 For the vanilla filling: In a the bowl of a stand mixer fitted with a paddle attachment (or with an electric hand mixer), mix the butter on low speed for about 30 seconds. Step 10 Add the vanilla and the confectioners’ sugar and mix until totally smooth. Add milk and pinch of salt and continue to paddle until smooth. It will look like white spackle and have about the same consistency. Step 11 The filling keeps in an airtight container at room temperature for up to 2 days or in the refrigerator for up to 2 weeks. Bring to room temperature before using.